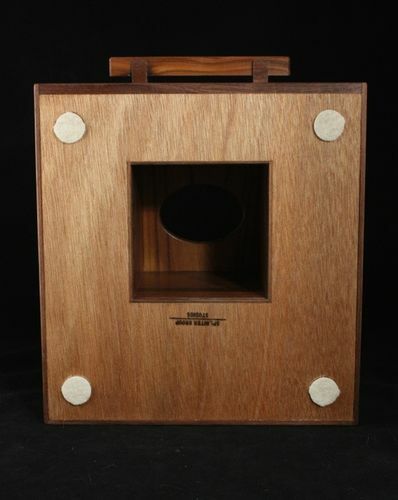 Walnut and Russian olive, about 11”x 11”x 5-1/4”. I imagine most everyone here that builds a new version of an older project will think of what was good/bad and try to improve things. I made a quick desktop organizer a while back out of necessity for a growing clutter of things on the table. My thoughts were spaces for remote controls, maybe a tablet, and a small drawer for all those little things. A place for a tissue box was high on the list. I’ve had several visitors ask about that item so I decided make a few more. Looking back there were a few changes I wanted. The tissue box is great to have, but ugly. I wanted this covered. Having space for a tissue box makes the unit rather tall, make the appearance look less chunky. Make the drawer stay closed. I came up with this new layout to solve several issues. The entire design centers around tissue box so I tried to minimize it’s footprint. Having a lid over the tissue dresses everything up, but without a clever way to make the lid lock into place, chances are that at some point pulling out a tissue will bring the lid with it. I decided the simplest way was to have the box load from the bottom. The inside dimensions are 4-1/2”x4-1/2” which makes for a nice snug fit. The lid is glued into place and since it is not removable, it can be thin. The felt pads are from the big-box stores as a variety pack of different sizes. These have double sided tape to hold them in place, but I know that they will not adhere to the finish and eventually get knocked off. I drilled a shallow 1” dia. recess after finishing to give them a place to “lock” into. A dab of epoxy in the recess backs up the tape to keep them in place. I profiled the dividers and sides out from the center so they taper to 3-1/2” tall. This makes it appear less blocky. The finish is simply Watco and paste wax. I wish there was an easy way to apply a protective top coat but getting into all those deep nooks is impossible. 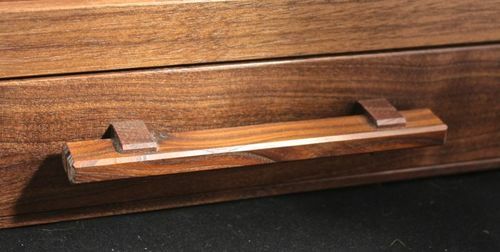 Prefinishing, which I do often, has its own issues with keeping the oil out of the glue areas (walnut just begs to be oiled). The drawer on the original never seems to get fully shut after digging around for some lost item. I added a magnet into the side of the tissue area and directly behind a magnet inserted into the back of the drawer. This provides a satisfying “self closing” feature. The magnet is hidden beneath a layer of veneer. The handle is a simplified version of what I used on a jewelry box. The pull is Russian olive with walnut supports. probably get rid of the divider that runs from the center of the tissue box area to the side (or make it run front/back instead). More thought on the drawer dimensions. This one is a tad too deep. Well thought out and great looking too! wow that is gorgeous,outstanding craftsmanship. Very handy and done beautifully! Very cool organiser, now if you could just make a box that can clean up my workshop! I think it’s really cool! Nice work as well. Splint, naturally, the craftsmanship is superb, but I really like the design because it demonstrates your creativity. However, I am curious about why you need all those little cubbies? All I have on my desk is my computer and my phone. Nicely done. 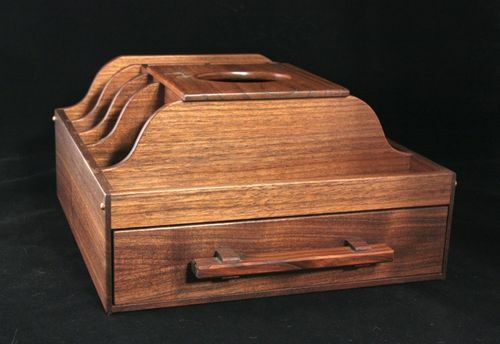 I’ve been thinking about a bedside valet, and I believe you just talked me into having a tissue compartment in it since now I won’t have to worry about the top coming off with a tissue. That’s a very unique project very nice work. Brilliant, as usual. The walnut looks great. Every part of this looks great. I especially like the drawer pulls. Nice design.